Actuators are power control units that are designed to help the valve do an action which is desired. When it comes to the types of actuators, there are two main categories including linear actuators and rotary actuators. Their main differences are in the movement they are designed to provide. Linear actuators allow the valve disc to perform linear movement while rotary actuators help the disc move in a rotating fashion. For the actuator to perform a stroke which is required, it needs to have the necessary power. This power is delivered through a hydraulic power unit that is specifically designed for this kind of service with the utmost safety in mind. Today we are going to talk about rotary actuators, what their primary functions are and how they fit within a certain system. Actuators can be mechanical or a combination of electro-mechanical components. These devices are designed to provide limited or controlled movements and sometimes even positioning. They can be operated manually or electrically, or they can be controlled with fluids, most commonly hydraulic and air. Rotary actuators are designed to provide rotary motion by converting energy. A typical example of these kinds of actuators is for controlling various types of valves like the butterfly, ball, and so on. Every actuator is different when it comes to its power configurations and can be shaped and sized differently, depending on what kind of application it’s supposed to have. There are many different types of rotary actuators since they are used in various industries. This means that they need to be designed specifically to serve the exact needs of a certain organization. Based on their design, rotary actuators can be Rack and Pinion and Helical. If high torque is in demand, the rack-and-pinion actuator is the best option. However, these actuators require a lot more space, as they have larger dimensions compared to the motors required to transfer high torque. The force is transferred through a piston that is usually placed diagonally with the propelling tappet. These rotary actuators are great for applications where high torque is required like in power stations, cement factories, steel industry, tire industry, and so on. Helical rotary actuators have a design which includes several helical gears. These helical gears are designed to convert linear movement into rotational movement. The longer the piston linear movement is, the greater the rotational movement. In most cases, multiple gear actuators allow the rotational play to be reduced down to 10 minutes. These rotary actuators are powered by fluid and they consist of pistons, output shafts, gearing, and cylinders. 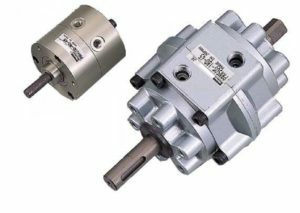 They can be used to convert hydraulic air pressure, gas, and fluid into rotary movement. Fluid rotary actuators are mostly used in automation applications with particular positions and controlled movement. There are many industries with this kind of requirement for rotary positioning. Some of the most common applications include clamping, damper closing and opening, door closing and opening, and so on. This type of rotary actuators are powered electrically and they consist of output shafts and motors. They have a limited rotary movement used to transform electricity into rotary motion. Electric rotary actuators are mainly used in automated applications when a vale or a gate needs to have controlled movement specific to required rotational positions. They are used in all industries that require correct positioning. These actuators can be driven by different types of motors. Some examples of applications include robotics, windows, quarter-turn valves, and so on. 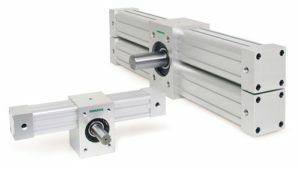 These mechanical actuators give rotary motion by transforming the force of manual screw rotation, gear, and levers. In most cases, they consist of levers, handwheel, knobs, and gearboxes that are operated by hand. They also have output shafts and threaded nut units. They are primarily used for operating various types of valves. This is why they can also be called valve operators. They can be used for globe valves, check, butterfly, and ball valves. They can be applied in small organizations and wherever there is a need for controlled and limited rotations. When choosing a rotating actuator, it is important to consider important parameters including timing, stroke length, loading, drive, and so on. All these parameters have unique capabilities considering applied force and speed of operation and narrowing them down can help choose the right technology for your application.